Miya Carmichael/Contributing Photographer Larry Huggins and Lindsey Moroch discuss how the beekeeping industry works and bees’ impact on the environment at an event hosted by Binghamton University Bees on Monday. The Binghamton University Bees held a presentation on Monday with local beekeepers to educate students on the recent decline in bees worldwide, how bees impact the environment and how beekeeping helps combat the decrease in the bee population. Larry Huggins, proprietor of Huggins Honey in Nineveh, New York and president of the Southern Tier Beekeepers Association, and Lindsey Moroch, a beekeeper at Kutik’s Everything Bees in Oxford, New York, described how the beekeeping industry works and the dangers of a declining bee population. According to Greenpeace, a global organization that uses peaceful protest and creative communication to expose global environmental problems, bee hives and colonies have historically declined by five to 10 percent during winter months, but in recent years, hives and colonies have commonly declined by 30 to 50 percent, sign of a rapid loss in the bee population. Huggins said although beekeepers are trying to slow the decline, natural obstacles like disease, weather and animals that disrupt the honey making process, including mice and bears, have made that difficult. According to Huggins, bees are pollinators, which make them a crucial part of food production across the world. He said he wanted to use his presentation to bring light to the issue of the declining bee population. Following Huggins’ talk, Moroch presented on the commercial side of the beekeeping industry and the role they play in the community. Kutik’s Everything Bees provides honey production, nucleus hive production and pollination, which involves sending their thousands of hives across the country to pollinate the myriad of produce seen in supermarkets across the nation. Moroch said this helps create a tight-knit, transnational community where beekeepers and growers work hand in hand to create the best possible product. Moroch said she hoped her presentation would give the audience a greater understanding of the bee industry. 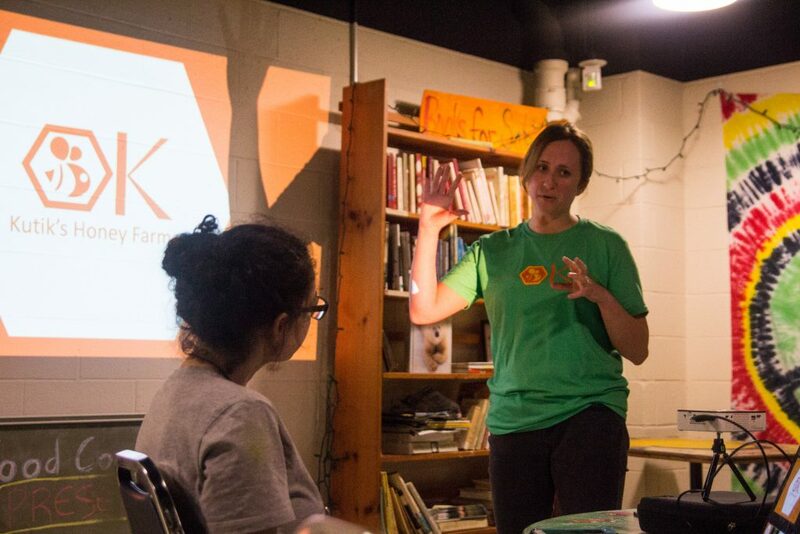 Molly Heit, outreach officer of the BU Bees and a junior double-majoring in biochemistry and integrative neuroscience, said the presentation was a good step toward spreading awareness about the importance of the bee industry. In conjunction with George Meindl, a visiting assistant professor of environmental studies at BU, the BU Bees have set up an apiary in the University’s Nuthatch Hollow natural area, where they currently have two hives. Club leaders said they plan to host more events to educate the student body on beekeeping and the role bees play in the environment.